The work of Oscar Niemeyer is featured in an exhibition that has just opened in Rio de Janeiro. Until January 31st, those who go through CasaShopping in Barra da Tijuca, in the city’s West Side, can see mock-ups and engravings signed by the architect, and to travel through the history of Brazilian architecture. 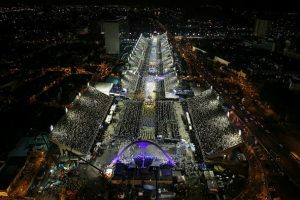 :: Sambódromo (Sambadrome): Opened in 1984, the stage of the samba school parade in Rio de Janeiro, which was also a venue for the 2016 Olympic Games and hosts concerts, is the architect’s work. The highlight is the Praça da Apoteose, with its large arch. (Rua Marquês de Sapucaí s/n, Downtown). Contemporary Art Museum (MAC): Is a symbol of the city of Niterói, 13 kilometers from Rio, in its metro area. The futuristic shape created by Niemeyer became an architectural landmark and is considered one of the seven museum wonders. Built with a reflecting pool surrounding it, the saucer-shaped building gains even more lightness. It features a panoramic view to Guanabara Bay, Rio and Niterói. (Av. Almirante Benjamin Sodré s/n, Niterói). 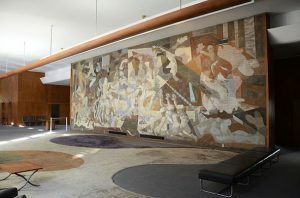 Gustavo Capanema Palace: Opened in 1945, the project was led by Lúcio Costa and had a team of young architects of which Oscar Niemeyer was a part. The building rests on ten-meter pillars and its 16 stories were erected with iron, concrete and marble. It has a garden designed by Roberto Burle Marx and murals of glazed tiles by Cândido Portinari. (Rua da Imprensa 16, Downtown). 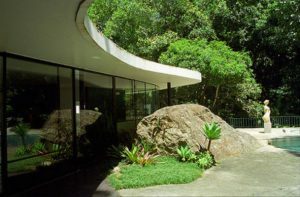 Casa das Canoas (Canoes House): Designed by Oscar Niemeyer in 1951 for him to live in, it is considered one of the most significant examples of modern Brazilian architecture, and is notoriously acknowledged by history and art critics experts as an accurate and premonitory synthesis of the modern architecture of free authoring that flourished in Europe and the Americas. The house is closed for restoration until January 2019. (Estrada das Canoas 2310, São Conrado). 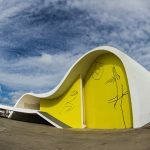 Teatro Popular (Popular Theater): Located on the Guanabara Bay shores, the Oscar Niemeyer Popular Theater opens the Niemeyer Way, in Niterói, comprising a cultural and tourist complex designed by Niemeyer. Its concept is plural, proposing a programming that goes beyond of what is a theater, where it is possible to contact all the arts, combining music, photography, dancing, painting, leisure and theater in one place. (Av. Jornalista Rogério Coelho Neto s/n, Niterói).